Sunday’s second cycling awareness ride for the A10 corridor showed some of the design decisions that can help to make this route a busy and convenient one for people on cycles. A pleasant cycle along the A10 track in full spring. The ride was very pleasant on a lovely Spring day. The countryside was looking beautiful with the cow parsley, hawthorn and horse chestnuts in flower. The path in the picture above is about 1.5m wide, however with the edges starting to break up and the verge herbs growing up the path feels very narrow and you have to cycle in single file. Unlike the verge on the immediate edge of the road this isn’t regularly cut. This is a rural route where there are few people walking on this shared-use path – it’s shared-use in the rural Dutch sense that pedestrians share the cycle track. However when you do meet someone walking they tend to step off the path to let the person cycling past. While that’s very kind of them, if the path was a bit wider they wouldn’t have to give way. 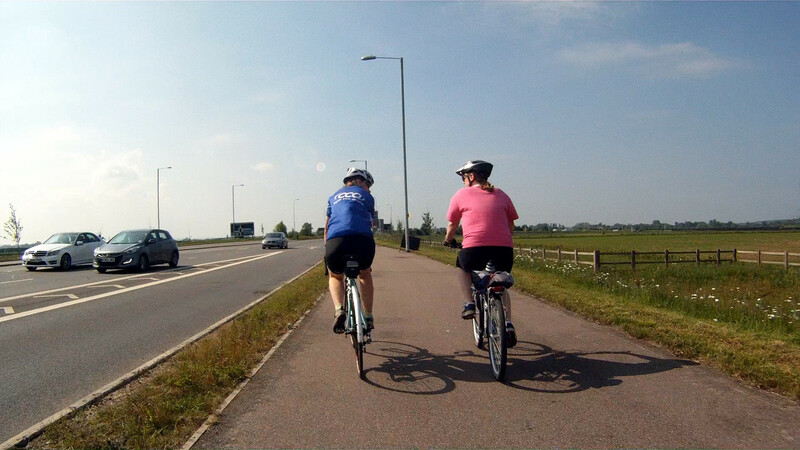 The situation is much different if you cycle up behind someone walking – potentially surprising them – or at night when people walking can be hard to see. 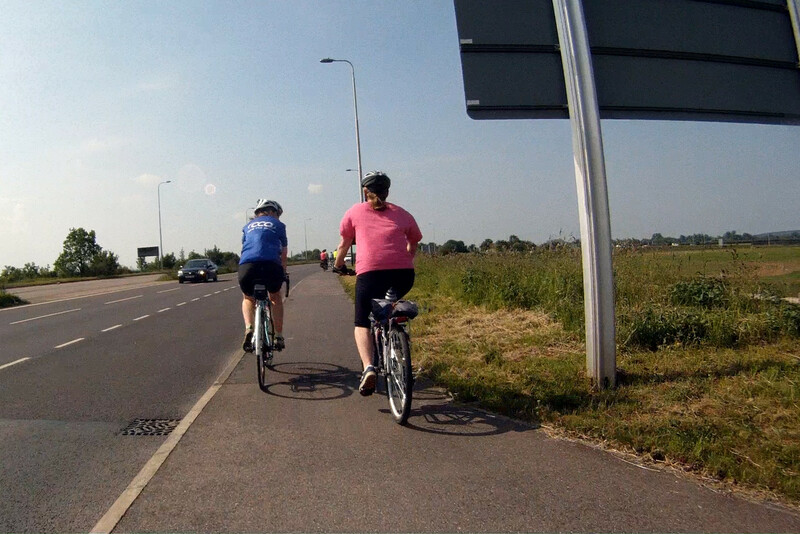 A wide cycle path allows people to cycle side-by-side and chat. When the path is wider – about more than 3m here at Trumpington Meadows – people cycle side-by-side and chat as they go along. There’s no need to concentrate on the path, instead you can relax as you cycle and talk to the person beside you. The path narrows and it’s back to single file. A short distance on the path narrows to about 2m and these two riders instinctively moved back to single file and couldn’t chat any more. With a oncoming coach and faced with a narrow path and no verge these riders pause. 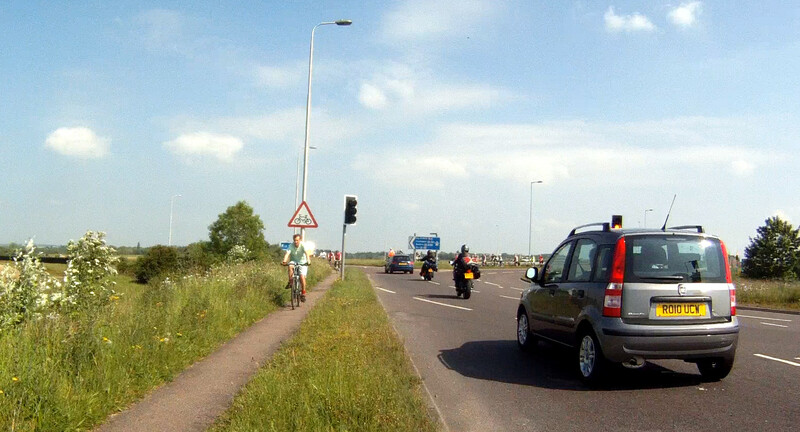 While most of the A10 path has a verge separating it from the road in some sections this isn’t the case. 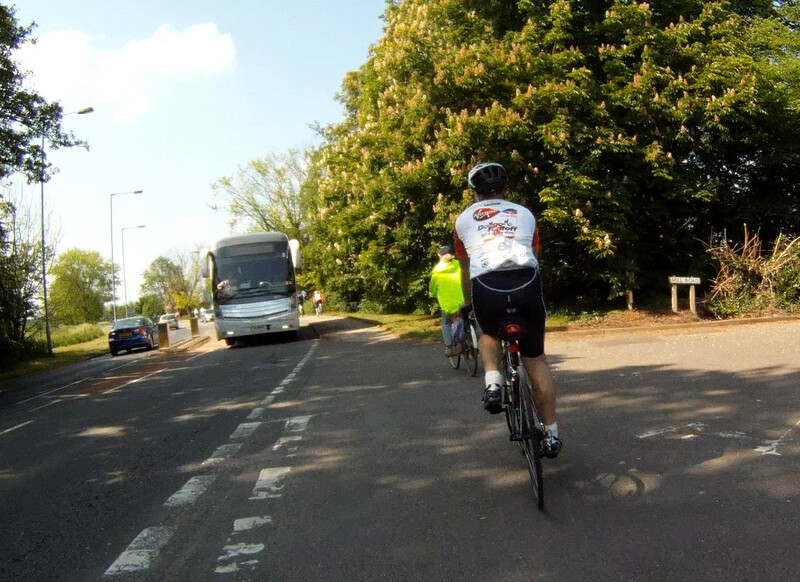 On leaving Harston I noticed a couple of riders holding back from joining the narrow shared-use path when they saw an oncoming coach. A verge provides reassurance that if you wobble a bit you won’t be hit by a wide vehicle and you don’t get blasted by its wake. The path through Harston village is very poor and will require a careful and considerate design if it is to be convenient for people on foot and bicycles and if it’s not to damage the look of the village in the way that the traffic calming has. A part of the new path alongside the A10 – an opportunity to chat again. A section of the path alongside the A10 was upgraded by Cambridgeshire County Council in the last year. The new path is of variable width and in places is about 2.5m wide and this allows people to cycle side-by-side, as the picture shows. It’s clear that the path should be built to >2.5m throughout to allow people to pass one another (on a cycle or on foot) and so you can cycle side-by-side. There also needs to be a verge to separate the path from the road. Waiting to cross the steady stream of motor traffic on the A10/M11 roundabout. Junctions and side road crossings are always a key issue on cycle tracks, especially on busy roads with high speeds. The speed limit on the A10 is 50mph in parts, 60mph in others and 30mph through Harston village. Fortunately the new route will avoid the A10/M11 roundabout yet the current crossing shows some of the problems. The roundabout is designed to smooth motor traffic flow with relatively high exit speeds from the roundabout. Although it must be relatively quiet on Sunday morning at 10am there was a steady stream of traffic and you have to wait a long time to cross or try and guess which way vehicles are going. Junctions like this need at least traffic signals for people on cycles and foot, or for very busy routes, an underpass. Crossing the A10 at Frog End can mean a long wait. Further along the route we had to cross from the path on the east side of the road to go in to Melbourn. Despite this being a Sunday morning and so not very busy, we had to wait and watch carefully and judge vehicle speeds in this 60mph section. It was easier for us, we had marshals to help. The cycle route needs a safe crossing here. The British solution would be a signalled crossing, the Dutch would probably consider this too dangerous and opt for an underpass or bridge. There is plenty of space here though such a relatively costly underpass or bridge should probably wait until the route is busier. 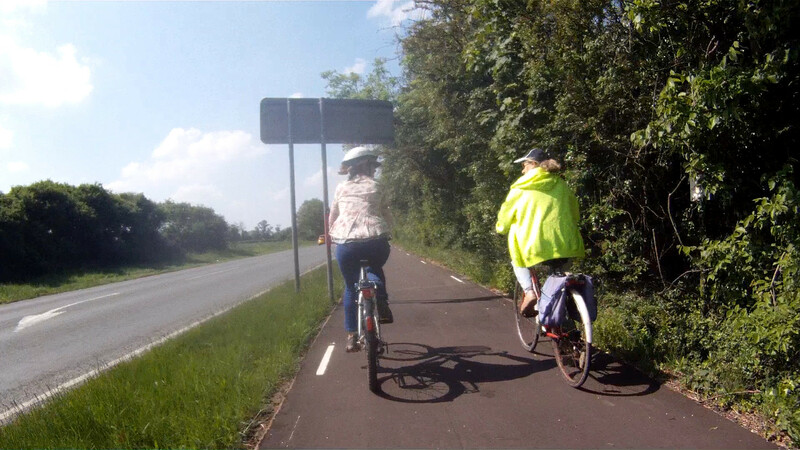 As part of the Cycle City Ambition Fund funding for Cambridge and villages a section of the path north of Frog End has been upgraded since last year. Plans are now being made for the section between Royston and Melbourn including a bridge across the A505. I think this will be a key link between Meldreth, Melbourn and Royston that will encourage new people to cycle as the current route on the A10 is very hazardous. See also: The 2013 awareness ride. This entry was posted in Cycling and tagged A10 by rich257. Bookmark the permalink.